Did you just feel some kind of ground movement? A shaking, jolt, or swaying motion? Report it to the United States Geological Survey for investigation here. In each case, they will record your input. If it's large enough or if a number of people report the same event, the USGS will examine local seismic records to determine a location and magnitude. 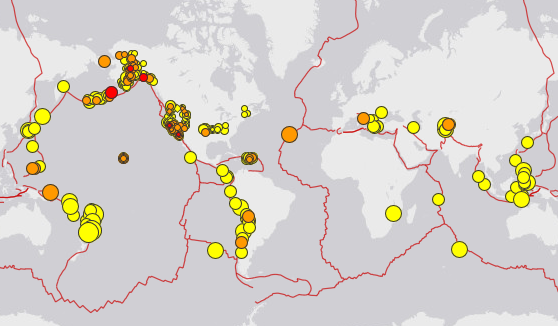 See where recent earthquakes are located relative to tectonic plate boundaries here from the USGS. Monday, March 4, 2019, Alderson, WV - 2:41 AM (EST) NEW! Wednesday, February 27, 2019, Shippensburg, PA - 6:52 PM (EST) NEW! 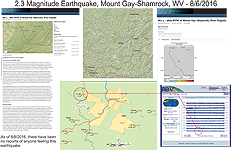 Download a poster (WVGES Document PDF, 3.55 MB) featuring information on the 7/20/2013, 7/30/2013 and 8/16/2013 earthquakes in Gilmer County. Tuesday, April 9, 2019, Bristol Island, South Atlantic - 1:54 PM (EDT) NEW! Thursday, April 11, 2019, Miyako, Japan - 4:18 AM (EDT) NEW! Friday, April 12, 2019, Luwuk, Indonesia - 7:40 AM (EDT) NEW! Thursday, April 18, 2019, Hualian, Taiwan - 1:01 AM (EDT) NEW! 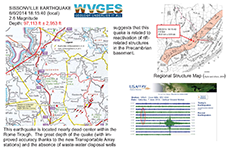 Earthquake epicenter data were compiled from several regional "catalogs". 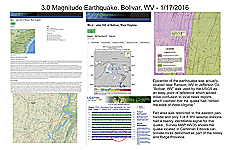 These catalogs consist of seismic event information that have been reviewed by seismologists. 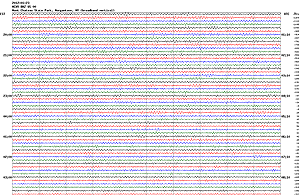 Unless otherwise noted, earthquake catalogs do not contain readings from "blast" or other related mining activity. Earthquake records are divided into two types: "historic" ones which were felt or recorded without sophisticated seismic equipment and "instrumental" ones that have data derived from networks of sophisticated equipment. ♦ With data (1.82 MB) here: PDF . ♦ Download a detailed Microsoft Excel workbook that was used to create the map of the earthquake epicenters here: XLSX. 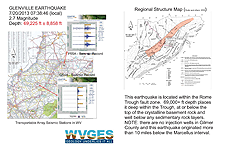 WVGES has an official USGS seismic station with two seismometers on site. Like radio stations with call letters, ours is "MCWV" which is "Mont Chateau West Virginia". Information about the MCWV Station can be found here. 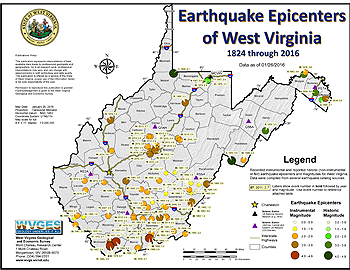 As of May 2015, the majority of seismic stations that were part of the Transportable Array Program sponsored by IRIS (Incorporated Research Institutions for Seismology) have moved east out of West Virginia. Four seismic stations of the original fourteen have been made part of the Central and Eastern United States Network (CEUSN) operated by the Scripps Institute of Oceanography at the University of California - San Diego. They remain in place and all are currently operational. View current seismic reading "snapshots" from the links below! Explanation of the signal trace on a seismogram. 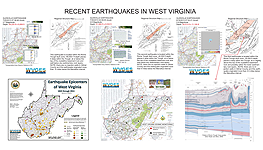 ♦ View detailed information for the remaining five N4.East Seismic Stations in West Virginia here. 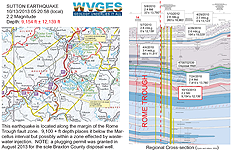 Earthquakes and Other Geologic Hazards, (Kentucky Geological Survey). 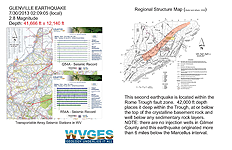 Earthquakes and Maryland, (Maryland Geological Survey). Maryland Seismic Network, (Maryland Geological Survey). The Ohio Seismic Network, (Ohio DNR, Division of Geological Survey). Earthquakes in Pennsylvania, (Pennsylvania Bureau of Topographic and Geologic Survey). 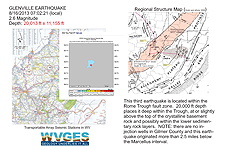 Earthquakes, (Virginia DMME, Virginia DMME Division of Geology and Mineral Resources). Page last revised April 18, 2019.